Solution: In this demo, we were using a Portable Raman Instrument supplied to us by Metrohm Raman (formally Snowy Range Instruments). We wrote a device driver to read spectra from it and send them to Analyze IQ RealTime, running on a Raspberry Pi embedded computer. 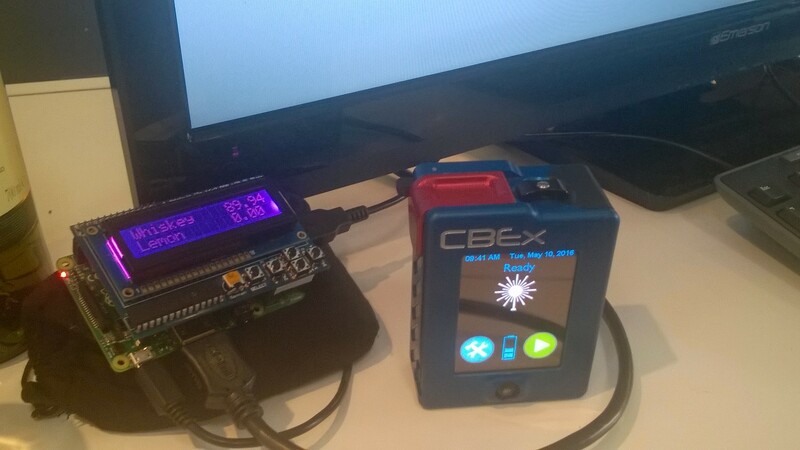 We added an LCD display to the embedded computer to display the analysis results. Samples containing mixtures of Whiskey, Lemon (Citric Acid solution) and Water are presented to the spectrometer. As soon as it is finished collecting a spectrum which is transferred to the embedded computer, RealTime running on the embedded computer analyses the spectrum and displays the concentration of Lemon and Whiskey on the LCD display and also the option of streaming back analysis results to a cloud-based dashboard. Methodology: Analyze IQ RealTime comes in 3 editions: Portable, Desktop and Cloud. For this demo, we used Analyze IQ RealTime Portable Edition, which runs low-powered ARM-based mini computers. 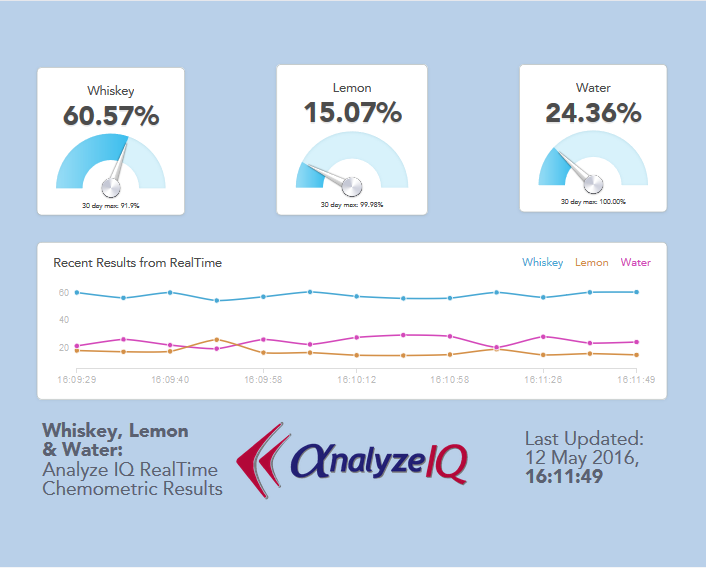 We made various mixtures of Whiskey, Lemon and Water in different concentrations, and used these to build chemometric models for each target on a desktop computer with Analyze IQ Lab. We then transferred the models to RealTime Portable Edition. Our chemometric models are imbedded in binary code including all information about preprocessing etc., and can be transferred from AnalyzeIQ Lab to RealTime's Portable, Desktop, and Cloud editions without any risk of introducing errors. There is a high degree of flexibility in the architecture of RealTime. All three editions use the same communications protocols and chemometric model representations, so it's easy to switch your solution to using one architecture or the other.